In this article we are going to look at why some people get “hangry” after not eating for a while or between meals. Hangry is a term used to describe those people that appear to get pretty angry and irritable when they haven’t eaten for a period of time. Some individuals feel like they need to eat every 2-4 hours to prevent these symptoms from coming on. The explanation typically given is that of low blood sugar, but how true is it and is there more to the story? What is the physiology behind getting hangry? Because the brain depends on glucose to function, the theory is that as glucose levels reduce, cognitive function is affected. The reduction in glucose is perceived as a life-threatening situation, resulting in the release of hormones that can help increase blood glucose levels, these include growth hormone, adrenaline, cortisol and glucagon. These hormones can help stimulate the release of glucose from two major glycogen storage sites, the liver and skeletal muscle (1), as well as a process known as gluconeogenesis, which is a fancy word for making glucose out of something that is not glucose (proteins and fats). Studies have demonstrated that very low blood glucose does not always trigger low blood sugar symptoms (2, 3). Likewise, one can experience low blood glucose symptoms when blood glucose levels are not always low. This therefore suggests that hanger along with other low blood glucose related symptoms like vertigo, sweating, tremor, blurred vision, anxiety, weakness, nausea, headache etc may actually result from mechanisms beyond just low blood glucose (4). According to the Whipple’s Triad criteria hypoglycaemia (low blood glucose) is seen as blood glucose levels drop below 50mg/dl, which in UK measurements is 2.8mmol/l, coupled with low glucose related symptoms and symptomatic relief with treatment such as IV or oral glucose consumption. Unfortunately, the rigidness of this criteria has resulted in a lot of confusion because of the variation between people who experience low blood glucose symptoms at varying levels of blood glucose. 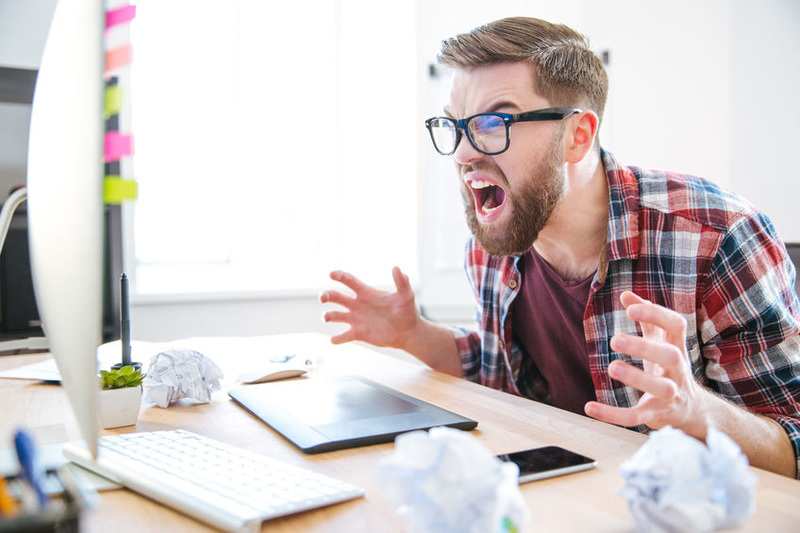 Let’s take a look at the varying theories of why one might experience becoming hangry or otherwise known as experiencing hanger (hunger & anger). The body has five hormones that help to regulate blood glucose. Insulin is there for when glucose levels increase, and we want to bring them down, and four other hormones are utilised to prevent glucose from dropping too low. If you have one for preventing it going too high and four that prevent it going too low, this says a lot about the value the body places upon preventing low blood glucose. The reason for this is because the brain desires a steady supply of glucose, as a result of glucose being one of its primary fuel sources. 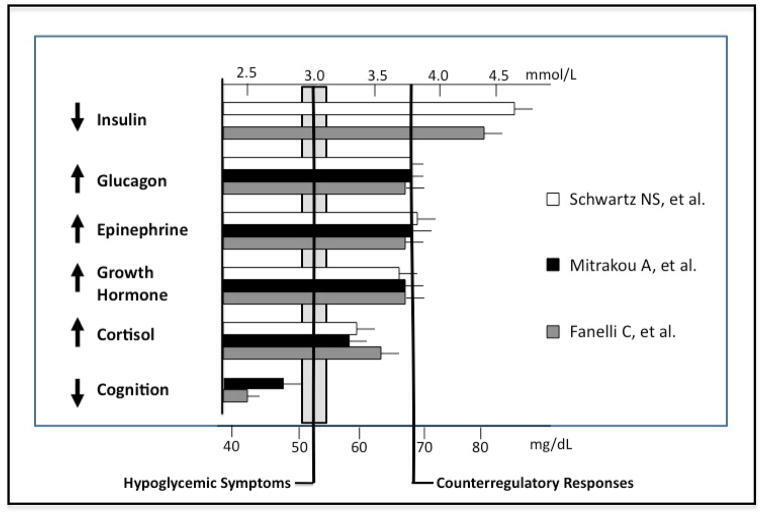 The image below summarises three studies, you can see that around 3.7mmol/l or roughly 70mg/dl glucagon, growth hormone and epinephrine/adrenaline start to increase. Not long after that (around 3.3-3.5) the studies then show an increase in cortisol. In relation to glucose and the counter-regulatory hormones there are two possible causes of hanger. Sympathetic/Adrenergic (elevation in sympathetic/stress hormones) – anxiety, irritability, sweating, palpitations. Neuroglycopenic (lack of glucose availability for the neurons of the brain) – hunger, dizziness, tingling, blurred vision. From the above you may be able to categorise yourself in terms of whether the symptoms you experience are more a result of a stress response or just a lack of available glucose. One study (6) demonstrated that some individuals have hypersensitivity to adrenaline, also known as beta adrenergic activity. This basically means that as glucose levels reduce, and adrenaline is released to help counter the reduction in glucose, some people react more strongly to the levels of adrenaline in the blood. Adrenaline is something that has been correlated with increases in aggressive behaviour and other symptoms like jitters, anxiety, rapid heart rate, emotional distress etc. In another study (7) it was demonstrated that some 3-4 hours after a meal those prone to low blood glucose and low blood glucose symptoms can experience a sharp elevation in cortisol. Cortisol is a hormone that has been linked with aggressive behaviour and may in some people explain the “hanger” response. Another possible mechanism is that of low cortisol. Some individuals suffer with sub-clinically low production of cortisol. 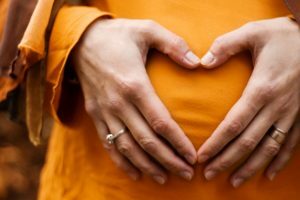 In these cases, you may lose the effectiveness of one of your main counter-regulatory hormones. As a result, this puts more demand on other counter-regulatory hormones like adrenaline, potentially contributing to actual low glucose or increased production of adrenaline and thus beta-adrenergic sensitivity. GLP-1 is a hormone secreted by something called enteroendocrine cells found in the gut. It does so in response to the consumption of food, in particular carbohydrates. GLP-1’s job is to stimulate the pancreas to release a large dose of insulin, even before glucose enters the blood stream, known as the first phase insulin response. As insulin levels increase, it suppresses the production of glucagon, shutting down the release of glucose from the liver into the blood stream. This makes sense because after a meal we want to be able to move sugar from the blood into cells and not continue to release glucose into the blood stream from the liver while we are absorbing it from food. Studies (7, 8) have shown that increase GLP-1 can play a role in inducing reactive hypoglycaemia (low blood glucose following meals). The challenge for some people is that overstimulation of GLP-1 resulting in excessive stimulation of insulin, thus suppression of glucagon can increase speed at which glucose is disposed from the blood into the cells (increased insulin sensitivity), increasing the likelihood of a sharp decline in glucose levels after a meal and thus low glucose symptoms or increased adrenergic activity such as adrenaline/cortisol response. People most prone to excessive production of GLP-1 are those who have what is known as increased gastric emptying, simply put it is an increase in the clearing of contents from the stomach into the small intestine. In this situation you are most likely to experience low glucose like symptoms and perhaps hanger within 2-3hours of eating your previous meal and you may also be suffering with digestive symptoms such as loose stools. If that is the case then focusing on addressing the underlying digestive issue should be a priority in addressing your glucose regulation. 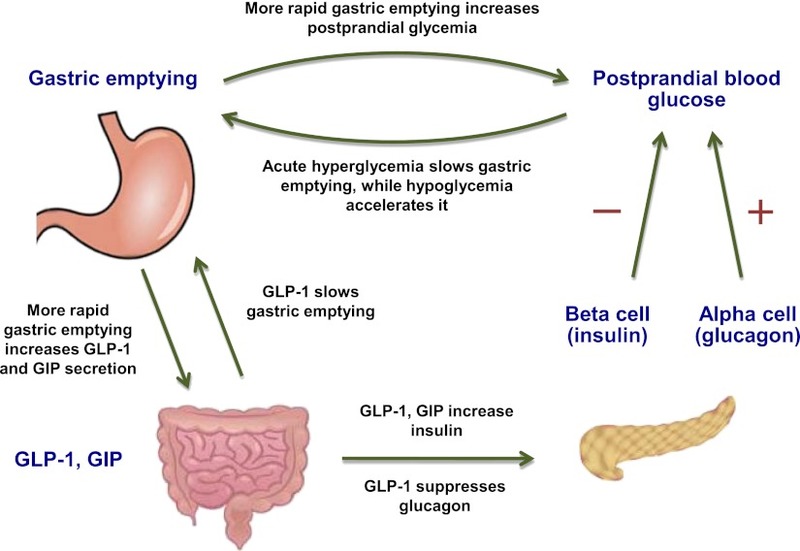 (9) Image demonstrating the role of gastric emptying, GLP-1 and glucose control. Once glucose from a meal has cleared from the blood, we then rely upon our stores of predominantly glucose and fatty acids to provide the fuel to make energy in our cells and for our cells to function. 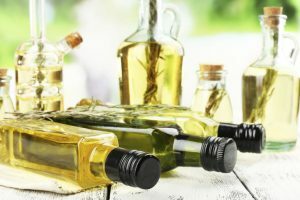 In some individuals their ability to make energy from fats or to convert fats into glucose in a process called gluconeogenesis can become compromised. A result of fat metabolism becoming compromised is the increased reliance on glucose as their energy provider. Let’s use a car as an analogy. Let’s assume you had a small tank of unleaded petrol in one car, yet in another car you had the same size tank of unleaded but also a huge tank of diesel as well. In one car you are reliant on just that one small tank of unleaded but in the other you can either use both tanks at the same time or when the unleaded runs out you can use the diesel tank to continue running your car for much longer. Everyone has the ability to metabolism glucose and fatty acids as an energy source as well as making glucose from fatty acids. However, some people lose the efficiency at utilising fatty acids to make energy. Reduced levels of an amino acid called carnitine is one potential cause of this. Carnitine along with some other nutrients like vitamin B2 are involved in the process of fatty acids getting into the mitochondria in the cells (11). This is essentially where the making of energy from fatty acids or glucose from fatty acids occurs. No entry means no party!! Carnitine insufficiencies are not overly common but may occur more in those on strict vegan/vegetarian/pescatarian diets because carnitine is found in abundance in red meats. It may also be more of an issue in those with very low muscle mass (10). Likewise, we can train the body to preferentially utilise certain fuel sources. Over time this may lead to some level of metabolic inflexibility. Inability to switch from one fuel source to another. A by-product of using fats to make energy is the production of ketones. Ketones are an alternative fuel source for the brain and arguably a preferred fuel source. Ketogenic diets which are very low carbohydrate diets with an emphasis on fats as the main provider of calories can help to produce more ketones. Those on ketogenic diets often see increased cognitive function. Periods of intermittent fasting have also been shown to be very effective at improving one’s ability to metabolise fatty acids and produce ketones. Be aware though that going from a diet very reliant on carbohydrates to fasting or a full ketogenic diet, may cause a bunch of symptoms initially, also known as the “keto flu”. This transition is rarely smooth so taking steps towards lower carbohydrate diets or slowly increasing fasting windows, is much more sensible than jumping in at the deep end. Hanger also appears to be stimulated by something completely non-associated to low blood glucose and stress hormones. Hunger and anger are both controlled by common genes. The product of one such gene is neuropeptide Y. This is a brain chemical that is released into the brain when you are hungry. As this chemical also regulates anger, high levels caused by hunger may also cause people to get angry (12). This makes sense from an evolutionary perspective as fighting for territory to ensure you have adequate food, especially in times of famine I suspect is a natural response, likewise when on the hunt being more aggressive and less empathetic would have been advantageous. In one study it was shown that individuals with personality disorder had higher levels of neuropeptide Y in their cerebrospinal fluid, and these levels were specifically correlated with aggression and impulsivity (13). What can you do to help prevent getting Hangry? The simplest approach is to plan for regular feeding intervals, however, this may not always be practical or sustainable and may never remove the reliance on regular feeding. For those that get hangry between meals, especially if within 5 hours or so of the previous meal, adapting the meal that preceded the hanger symptoms may be wise. Those with hangry symptoms often have a heavy reliance on higher carbohydrate foods in their diet. 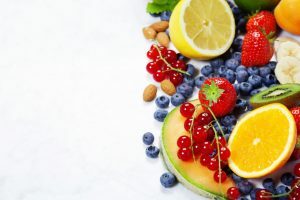 Therefore, adapting your diet to be lower in carbohydrates, especially refined carbohydrates, whilst increasing the intake of fibre (especially fibrous vegetables), proteins (meat, eggs, fish, legumes, pulses etc) and fats (nuts, seeds, olive oil, avocado, coconut, butter etc) will help to better regulate blood glucose levels and create less demand on hormones like cortisol and adrenaline to do so. Proteins, fats and fibres can help slow the speed of digestion, which can both slow the rate at which food enters the small intestine (helping to control certain gut hormones involved in glucose regulation, such as GLP-1) as well as glucose entering the blood, meaning glucose is typically more manageable. Fibres and proteins especially have been shown to improve satiety (sense of fullness), thus in the case of neuropeptide Y, feeling less hungry less often is likely to help prevent triggering off the anger associated with the hunger. Mindfulness can help to regulate how reactive we might be to stressors. Practicing periods of mindfulness in the day or perhaps even before meals is a nice practice to get into. This can be as little as 3-5mins. Bringing awareness to your breath and how you are at that moment in time can be a useful practice not only to help prevent the onset, but also when you are experiencing hangry symptoms a tool you can fall back on to help guide your mind. Sometimes just being aware of how you are feeling and acknowledging it is enough to help control impulsive behaviour. 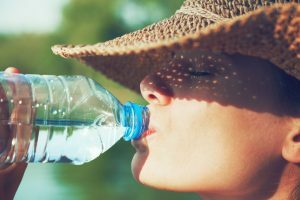 Other times you may want to acknowledge and then perhaps take a walk or pour a glass of water or a herbal tea and see if the symptoms subside. Hunger is not always something we must immediately act upon, in fact being aware of hunger and not acting upon it every time can help empower your relationship with food. Planning is also a contributing factor. If you know that you feel hangry after 5 hours of no food and adapting your diet isn’t making a difference, then you may have to schedule in times to eat to prevent those symptoms from occurring in the first place. Be open with people around you and perhaps prep some balanced snacks that you can keep in your bag or at work like a piece of fruit and some nuts. Try to avoid the temptation of high sugar and highly refined food products which might make you feel good for a short period of time but push you back into the cycle that got you there in the first place. Stimulants may also be worth limiting in some individuals. If you are sensitive to changes in adrenaline and cortisol and you haven’t eaten for a while, high levels of stress or a high intake of caffeine may actually trigger off symptoms like hanger, anxiety, jitters etc. Try replacing high caffeine beverages with reduced caffeine or caffeine free options. Likewise, try and limit the intake of high sugar drinks, something that might create a vicious cycle of symptoms. The sensation of hanger, can in most people, be completely eliminated by adapting dietary habits as well as improving one’s ability to metabolise fats as an energy source. Our body has mechanisms to make glucose out of fats and the more efficient we are at that the less likely we are to experience low glucose symptoms and struggle to go between meals without eating. To help with this you might want to look at a diet that is higher in fibre, fat and protein comparative to carbohydrates, especially refined carbohydrates like flour and sugar-based products. You may also want to experiment with controlled longer periods of complete fasting between meals to help train the body away from the “need” to eat on such a regular basis.